16 women from the same nursing unit are pregnant, so don't drink the water! 16 women from the same nursing unit are pregnant, so don’t drink the water! 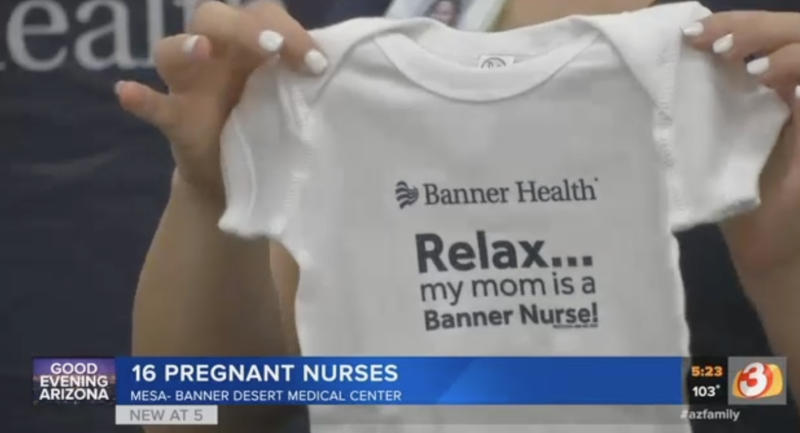 An Arizona hospital is raising eyebrows as it navigates a baby boom that’s seeing a whopping sixteen nurses in the same ICU expecting babies. “They’re wondering what’s in the water,” nurse Ashley Atkins told KPHO-TV noting that having a bunch of co-workers to lean on during this life-changing time has been brilliant. “This isn’t an easy job to have when you’re pregnant and not feeling well all the time, so it’s nice to share stories and have that support, and then you find out how supportive your co-workers are of you, and your management team, so it’s been a good experience,” Ashley said. The reality of the many-babied staff dawned when one by one, the nurses were added to a Facebook group for pregnant staff. “One after another after another,” popped up in the group chat nurse Jolene Garrow said and before you know it they’d rounded things off to an even sixteen. Most of the nurses – who work at Banner Medical Center’s Intensive Care Unit – are due to deliver between October 2018 and January 2019. The hospital said they’re well prepared for the upcoming baby boom. “We’ve been planning for this for months,” director of nursing for Banner Desert’s Trauma Neural ICU and Medical ICU, Heather Francis said of her very expectant gang. Relief staff are at the ready to ensure patients are well cared for while the nurses are taking time off to give birth and get to know their bubs. Sixteen custom onesies are go! Of course, the hospital is also prioritising the baby-expecting 16’s health as their pregnancies progress. They’re planning a group baby shower next week, too. Congratulations, ladies!